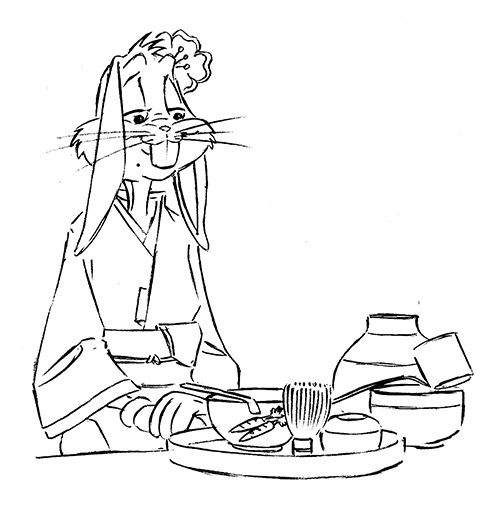 Bugs Bunny’s turning Japanese, I think he’s turning Japanese, I really think so. Friends of our family live in Taiwan, and one of the sisters participates in Japanese tea ceremony competitions. She asked me to do a tea mat for her, after she saw the Bugs Bunny themed art I did on my mom’s kitchen walls. She didn’t really know what she wanted, but she mentioned how she loved the Bugs Bunny images. The mats are about 6′ long, so I did a sequence of drawings that you might compare to an animated flip book. Each shot was Bugs performing a different step in a traditional tea ceremony. I don’t have any pics of the final, which wasn’t easy to paint as the mats are woven bamboo strips. Before I started though, I did a concept drawing of what Bugs would look like on the mat, so here that is at least.